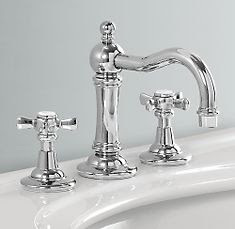 If there is anywhere in a house that I believe you should invest in quality, it is in hardware: hinges, doorknobs, cabinet hardware, and faucets. I call these things house jewelry. Like the jewelry we wear, hardware in a home makes a very definite style statement. Unfortunately, I think we often do not budget enough when building and remodeling for this very important aspect of home design. 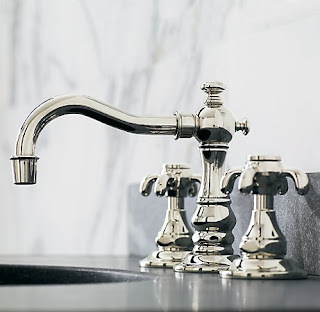 How much can a measly little faucet cost, right? For a good quality one, more than we sometimes think. 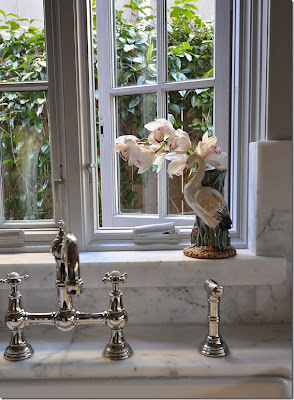 A while back Joni at Cote de Texas walked us through her kitchen remodel and I remember her sink and marble counter being my favorite part of the room, but at the time I didn't pay close attention to the brand name she listed for her kitchen faucet. Since then, I have taken a whole-house remodel and re-decorate project and have been out shopping (a lot!). So faucets are at the forefront of my mind right now. When she posted a picture of her kitchen again for her New Year post, it jogged my memory. 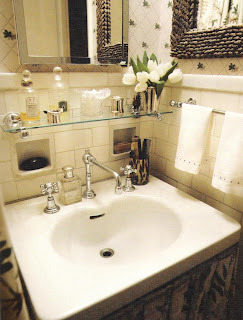 Here is a picture of her beautiful kitchen sink and faucet. The last few years a number of finishes were big on the market. Oil-rubbed bronze, satin nickel and stainless, to name a few. These are still being shown in a big way in the showrooms and big box satores in my city. But the finish that I have fallen in love with is polished nickel. I'm not sure the love affair will ever end either! 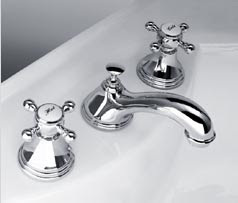 The best thing about polished nickel is its undertone, which is warmer than the blue undertone of polished chrome. It is classic and less trendy-looking than some finishes. It works so much better with the palettes I like to work with, which almost always have a warm undertone. 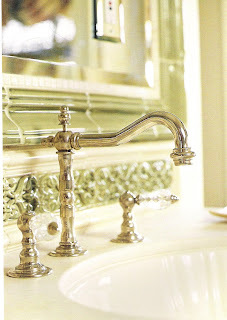 This photo shows that wonderful silver/gold finish that I love about polished nickel. It just can't be duplicated, in my opinion. Polished nickel heaven! Faucet and hammered nickel sink. Just fabulous. I think you can see that this finish really is almost jewelry-like in appearance. Shiny, yet warm and appraochable at the same time. Forgive me if I gush. But a newfound crush can do that to you! 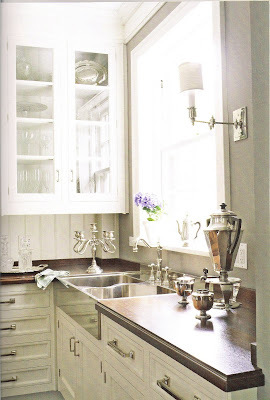 I agree with you, polished nickel is lovely. It has a mellow look that seems timeless. 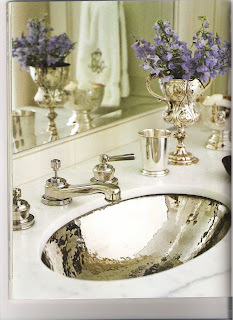 The hammered nickel sink- fabulous! Great post. So pretty! And I found out this year that I'm allergic to nickel! I had to swap out the handles on my faucets for ceramic. Sadness. Sharie-Yes, I agree it is lovely. And your description "mellow" is perfect. Linda-How terrible! That would definitely make me sad, too, because nickel is beautiful and often pricey. I completely agree. It is in the fine detail you really see the quality. Hi, I'm doing polished nickel throughout our home, but I'm not finding affordable options for the laundry and bar area. What do you recommend? There are a lot of stain and brushed nickel on the market, but not sure which would compliment those rooms the best.